Two things first: 1. I honestly don’t know why I originally put this on my to-read shelf. Maybe it was the adorable cover art, because honestly when I started reading it, I didn’t recognize the synopsis on the book jacket. 2. I kept getting the title mixed up with the movie, Misses Pettigrew Lives For A Day, which is also almost unmanageably cute, and I recommend it to everyone. The premise of this story is simple (skip this if you want to go in like I did without knowing anything about the story). Curmudgeon Major Pettigrew finds out that his brother has just passed away. His neighbor Mrs. Ali had just happened to swing by that day in order to collect newspaper money and takes the opportunity to comfort him. Her sweet gesture of condolence eventually leads to cute old people love. However, since they live in a tiny conservative village, many look down their newfound love upon, since Mrs. Ali is of Pakistani descent. This book is subtle in how it confronts the small everyday prejudices that people have. Although there are some scenes where the white community is very rude and inconsiderate, there is never any huge fight that causes major upheaval, which many plots that have intercultural disputes seem to have. Instead, this book examines the smaller, yet probably more serious, prejudices that exist. Throughout this novel, Major Pettigrew has to examine where he stands in the community and where he stands with Mrs. Ali, and come to terms who is more important to him. This book also kept me on my toes. 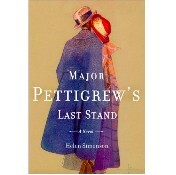 I kept trying to figure out what Major Pettigrew’s last stand would be. At first I thought it was going to be an inheritance rivalry over a pair of guns, and while the guns were always in the story, you quickly saw that they wouldn’t be the final issue. I won’t say what the last stand was, but it was something I was not expecting at all, and I praise Simonson for that. I know that I’m not doing justice to this book. All I can think of to say is “Oh goodness it was sweet/cute/touching/adorable/adflkjfsf SOO GOOD”. Please pick it up as soon as you get the opportunity, and don’t put it down until you’re done. I enjoyed your gushing review! It's on my list, but maybe I should move it toward the top! I've heard of this book but never really looked into what it was about. I guess I just assumed it related to the movie, Misses Pettigrew Lives For A Day (I think it is also a book?). Ahh I didn't realize that Misses Pettigrew Lives For A Day was a book originally. Definitely just added it to my to-read shelf. All I know is that the movie is fantastic. It has Lee Pace in it, what else do you need.